Lately there has been a lot of talk about customer experience, or CX. Its value and importance within a given brand is at or near the top of the priority list for many companies the world over. But as important and as talked-about as CX is, there is a debate as to who should lead the charge—drive the CX bus, if you will. In my not-so-humble opinion, it should unequivocally be the CMO. I use the phrase “not-so-humble” because in my experience contributing to Forbes for over eight years, specifically their CMO Network, I have gotten to speak with and understand many a CMO. 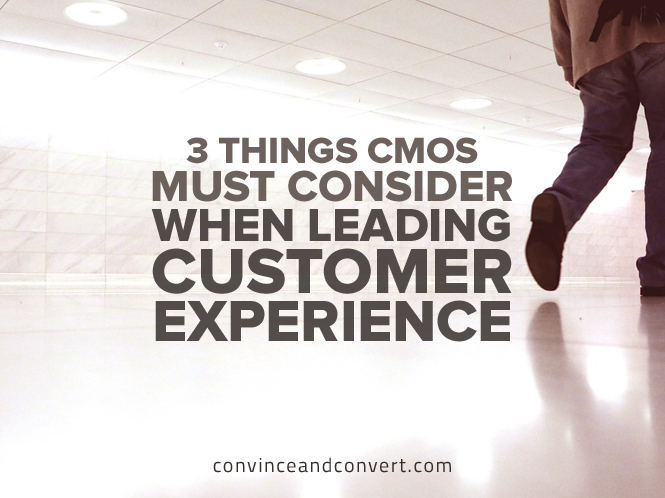 For a CMO to lead the overall CX of a given brand, there are some principles they need to consider first. This may be the most important principle in an era of digital business. Creating top-flight customer experiences that tie together web, commerce, and mobile technologies is key. Do this, and your role as CMO will become very clear to the CEO, especially in how it affects revenue, profit, and margin. Passion cannot be faked. It must be real, or you shouldn’t bother. Moreover, a CMO must bring that passion when breaking down silos that more than likely exist to create true cross-team collaboration and change. The sheer number of technology marketing vendors in the world today is staggering. One look at the latest version of the now-infamous Scott Brinker Marketing Technology Landscape chart will tell you all need to know—with no shortage of options. A CMO needs to be able to weed through all these options and know specifically what is required to meet their particular needs. And the best person qualified to handle all of this is the CMO.